We’ve all said it… and meant it… but for whatever reason, the dinner just never happens. Yet when it does, it’s always a treat. Last summer, some “new-ish” friends DID follow through and invited us over. We knew the company would be great — the delicious meal was a bonus! 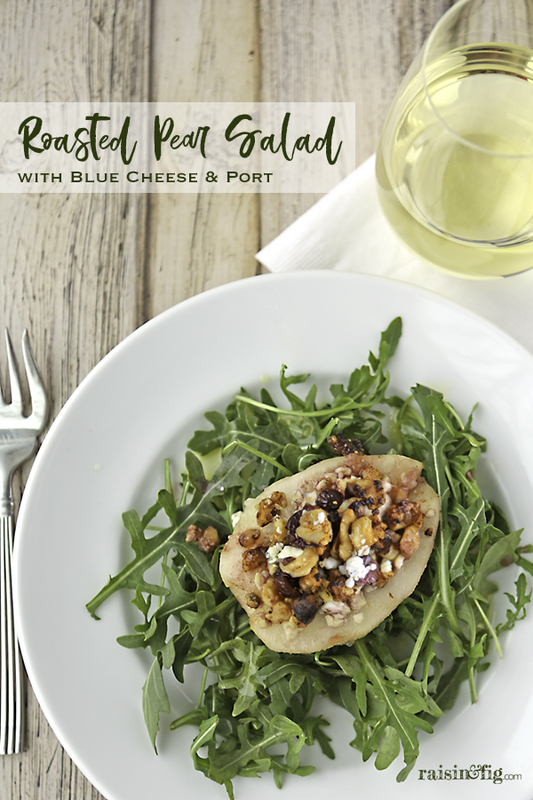 They served steaks from the grill, warmed bread and this Roasted Pear Salad with Blue Cheese and Port. Simple. Elegant. Fabulous. Thankfully, our hostess shared the recipe – and I’ve been making it ever since — for many of my dinners with friends. We all love those recipes that are quick and easy enough for a weeknight meal (or girl’s lunch), but also have enough “curb appeal” for entertaining. Turns out, this is one of The Barefoot Contessa’s recipes, so it’s no surprise it fits the bill. The original recipe calls for Anjou pears to be filled with cranberries, walnuts and blue cheese, then drizzled with a mixture of port, brown sugar and apple cider, before roasting in the oven. They’re served warm or at room temperature on top of a bed of greens, dressed with a simple combination of fresh lemon juice, good olive oil and some of the basting liquid from the pears. The pears and the dressing can both be made ahead of time. You can roast the pears earlier in the day, and just bring them back to room temp or pop them in a warm oven for a bit before plating. Sharing a home-cooked dinner with friends — old or new, is a gift. When the food is memorable, it’s a bonus. You know those friends you’ve been meaning to have over for dinner? Call them. Just before serving, whisk together the olive oil, ¼ cup of lemon juice, and ¼ cup of the basting liquid in a large bowl. Divide the arugula among 6 plates and top each with a pear half. Drizzle each pear with some of the basting liquid, sprinkle with salt, and serve warm. You, my friend are super talented in BOTH the kitchen and behind the camera! Though in the past I have declared that pears are to fruit what carp is to seafood, I do love the combo of pears paired with stilton. If I have a’pear’antly said to much here, feel free to pare down this post to maybe just a pair of sentences.